Brujeria, the Mexican murderous deathgrind outfit shrouded in mystery have announced that they will be infiltrating our UK shores later this year. They will be playing a co-headline show on August 14th at The Dome, London. 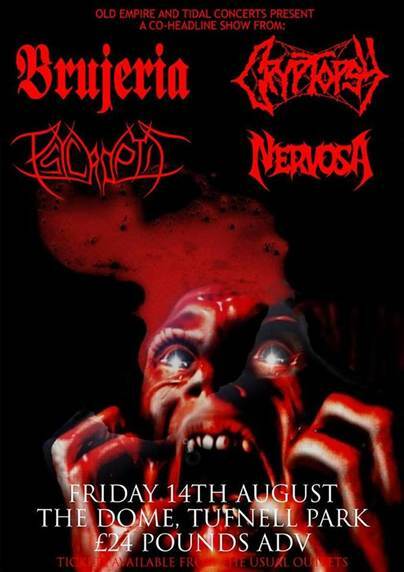 Playing alongside them are Canadian extreme metallers Cryptopsy with support from Psycroptic and Nervosa. But what do we actually know about this masked death squad? The name ‘Brujeria’ derives from the black magic used by some Mexican drug dealers to inspire fear in religious locals. It is said that this unit of banditos is made up of Satanic drug lords who came together to make music on Brujerizmo – their own brand of brutal ‘machete metal’. But what is the truth? Regardless of who they are or what they stand for Brujeria remain a force of nature. A very evil nature. Brujeria’s new album is due for release late this summer globally via Nuclear Blast Records. You can purchase tickets for the show from the venue’s website.